There are times when you want to restart Firefox, just for freeing some memory or for testing something new, but you are afraid that you will lose all the opened tabs in it. Normally you can use the session-manager in Firefox or use an addon like Tab Mix Plus to save the browsing session and then restore it from the settings. But is there a quick way to restart Firefox without the hassle of saving and restoring it? Say hello to Restartless Restart. As the name suggests and you may have guessed, installing this addon doesn’t require you restart Firefox to enable it. It works right from the moment you install it. The addon itself is a mere 15KB download. To restart your browser you can either Click on File > Restart or use the hotkey combination of “Ctrl + alt + R”. You can also change the hotkey from the options in the addons manager. 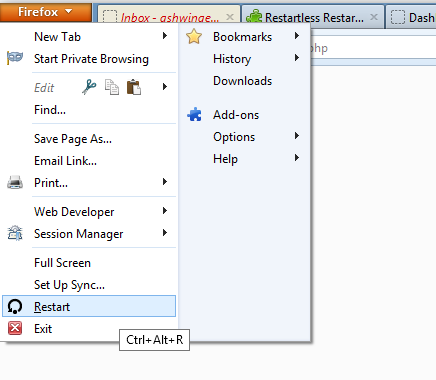 Download Restartless Restart from the addon page. This addon will work on Firefox, Thunderbird and Seamonkey. I have been using it on Firefox for sometime and it works on the latest version too, i.e Firefox 17.